In a large bowl mix gingersnap crumbs, butter and sugar. 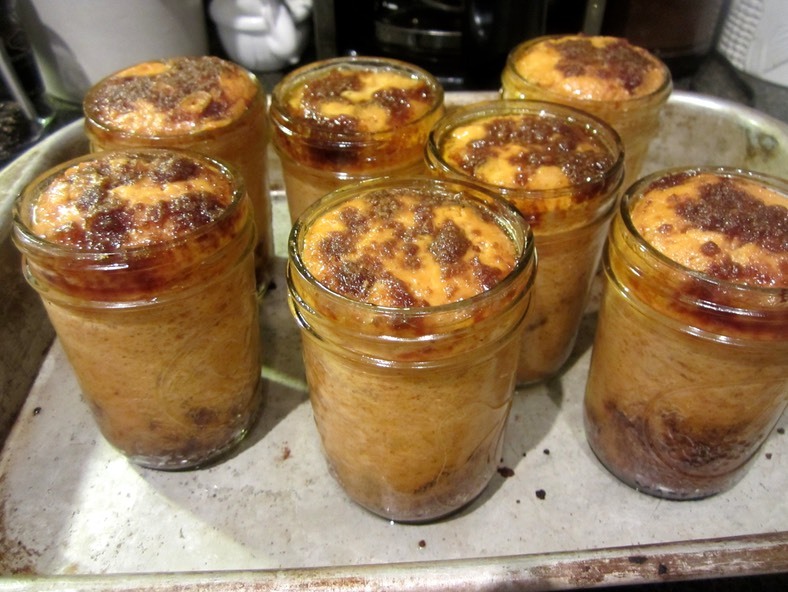 Reserve ¼ cup of crust mixture for topping and divide the rest between the 6 jars. Mix all ingredients for the filling together in a large bowl stirring with a whisk to combine. Line a baking sheet or pan with foil for easy clean-up and place jars on the sheet. Bake for 15 minutes, remove from oven and top each pie with about a Tbsp of reserved crust. Bake pies 10 to 15 minutes longer. A knife inserted in the filling should come out clean. At this point you can either eat them, or put the tops on and store in the fridge for a couple of days. Whipped cream: whip one cup of cold cream with 4 Tbsp confectioners sugar until stiff peaks form. Mix in 1 Tbsp bourbon and 1 Tbsp maple syrup.